Summary 12-bay, expandable, high-performance BYOD SATA NAS with LAMP webserver and many media services based on Intel Atom D525 processor. The DS2411+ is a twelve bay dual-core Atom (D525) for buyers looking for a high-capacity NAS, but looking to save some money by sacrificing some performance. 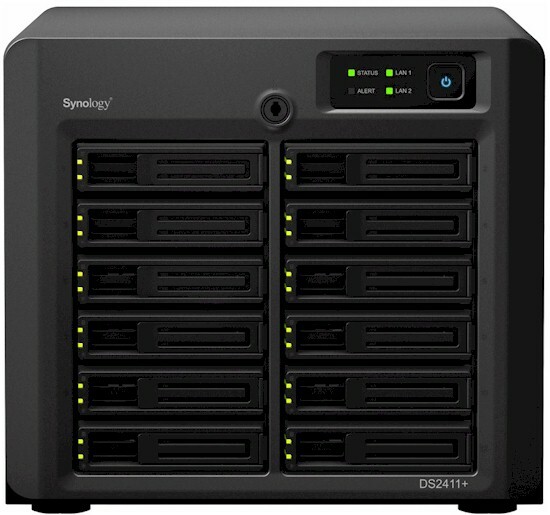 It sits at the top of Synology's Small/Medium Business line, just as its beefier (and much more expensive) sibling, the DS3611xs, occupies the top slot in the company's small "Large Scale" Business family. Aside from the capacious twelve bays that hold 2.5" or 3.5" SATA drives, the 2411+ can be expanded with twelve more drives via the DX1211. This box is connected via an Infiniband cable and can also used with the DS3611xs. The DS2411+ is a fairly imposing box, standing about 10.5" high, just shy of a foot wide and a bit more than a foot deep. And fully loaded with all twelve drives as my review sample was, this sucker is pretty heavy, too! The annotated front and review views in Figure 1 show a few noteworthy things. First, you'll note the lack of LCD status panel. This isn't essential, but is usually found in NASes of this class and price range. Instead of per-drive locks, the single lock (3) secures all drives, just like on a desk or filing cabinet. There are no USB ports on the front panel; all four USB 2.0 ports are on the rear. It would have been nice for Synology to include USB 3.0 or eSATA ports to provide faster transfers for attached backup, but no dice. You do get a 15 pin video connector for direct console support and there is also a 9 pin serial COM port. Note that both are marked "manufacturing use only" above, but don't let that stop you. I didn't disassemble the unit for my usual set of pictures. This is because I found a very nice set of internal pictures and parts description in Steven Walton's review over on TechSpot. So, I borrowed (with permission) the board shot in Figure 2. I have summarized the key components in Table 1. Steven's article has more commentary if you need it. I'll just note that, contrary to Steven's description, there is not a door in the outside cover to access the expansion SoDIMM RAM slot. But once you remove the main cover, you can get to the slot by a cutout in the internal chassis sheet metal. Power consumption measured 132 W with the twelve WD RE4 2 TB 7200 RPM (WD2003FYYS) drives that Synology installed spun up and 45 W when the programmable drive spindown kicked in. Note that when drives started to spin up after a short power-on delay, my power meter momentarily peaked at over 300 W.
The DS2411+ is relatively quiet considering the number of drives it has. I've had four-drive rackmount NASes in for testing that were so screamingly loud that they had to be banished to a back room! In contrast, the 2411+' form-factor has enough space for two 120mm (4.7") case fans and the drives are spaced with almost 1/4" above and below each one. So the fans don't have to work too hard to pull enough air through to keep the drives cool and can be run at low speed. The fans didn't even have to ramp up to keep things cool during testing. Still, this isn't something you'll be wanting to keep in a bedroom or even media room, since twelve drives spinning at 7200 RPM plus head noise would definitely be noticed. The 2411+ supports all the features in Synology's DiskStation Manager (DSM) 3.2 OS. A few tweaks have been added since I reviewed DSM 3.0, such as the Package Center that makes it easier to find and load optional features. Synology added the option to back up to Amazon S3 a few releases ago and now fully supports Mac OS Lion for file access and Time Machine backup storage. For more details on 3.2's features, check out the live demo or hit its page.